Founded in 1927 as the Carthage College A Cappella Choir, the College’s premier vocal ensemble is now in its 90th year. Originally a choir that performed a cappella choral music solely from the sacred repertory, the choir now performs sacred and secular music from the full expanse of choral traditions. Since 1973, the choir has taken 15 European tours to Austria, Czech Republic, England, France, (the former) East and West Germany, Holland, Ireland, Italy, Northern Ireland, Poland, Scotland, Switzerland, and, Spain. 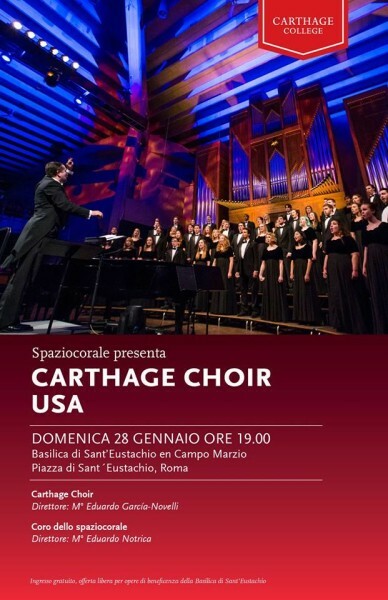 Carthage Choir will tour Hungary, Slovenia, and Italy in January of 2018. The choir tours Europe every three years during the College’s January term.